Clip about the book An Acid River Runs Through It from The Times, South Africa, Sep. 17, 2015. I hear those who have bought the book are happily surprised about how quickly it arrived. Some reported four days from purchase to delivery – in another country – inclusive of printing. (It’s a print-on-demand solution). Eva-Lotta Jansson talks about her new photo book an An Acid River Runs Through It. Copyright © Eva-Lotta Jansson 2015. No part of this this book, or this video, may be reproduced, transmitted, or stored in any form or by any means, without written permission from the author/photographer Eva-Lotta Jansson. An Acid River Runs Through It is a photo-documentary essay about acid mine drainage — water pollution caused by historic and some current mining activities — and how it affects water resources and communities in South Africa. An Acid River Runs Through it is now a book. Read more here. 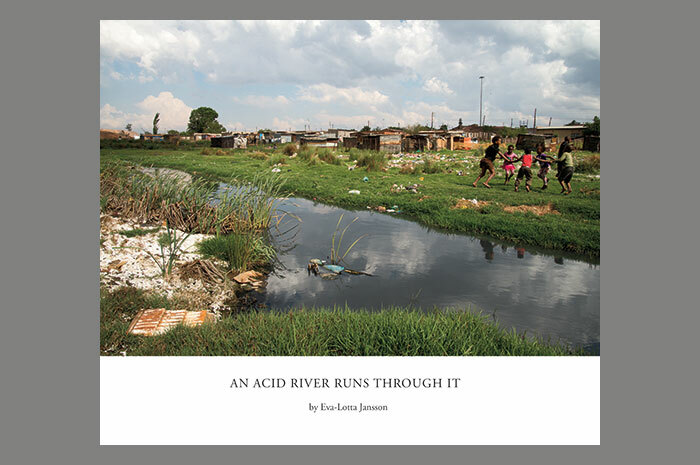 An Acid River Runs Through It is a factual photo book about mine water pollution in South Africa. It addresses questions like: What is acid mine drainage? How did it start? Who is affected? It’s hoped that the pictures, interviews and text could help bring about awareness and discussion about the urgency of the situation. 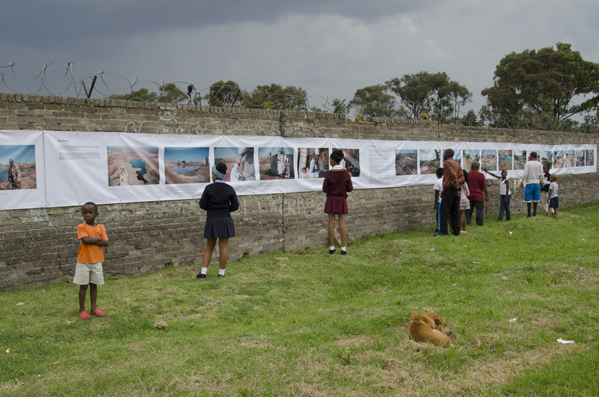 Some pictures from An acid river runs through it, my outdoor exhibition in Davidsonville, Johannesburg, this weekend. Davidsonville is one of the affected communities documented in the photo essay. Images are copyright Eva-Lotta Jansson and may not be used without permission from the photographer. This work was supported by a grant from the Ford Foundation, for which I’m very grateful. 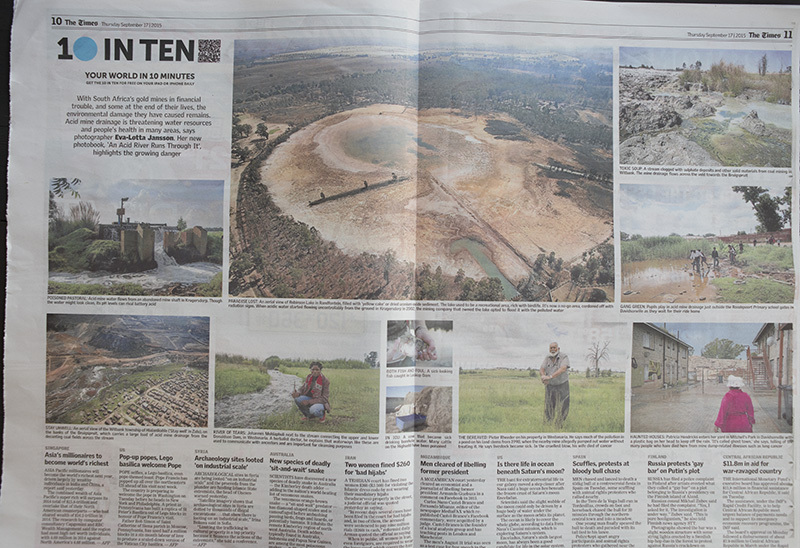 Just launched an Acid river runs through it, an outdoor photography exhibition about acid mine drainage – water pollution caused by historic- and some current mining activities – and how it affects water sources and communities in South Africa. 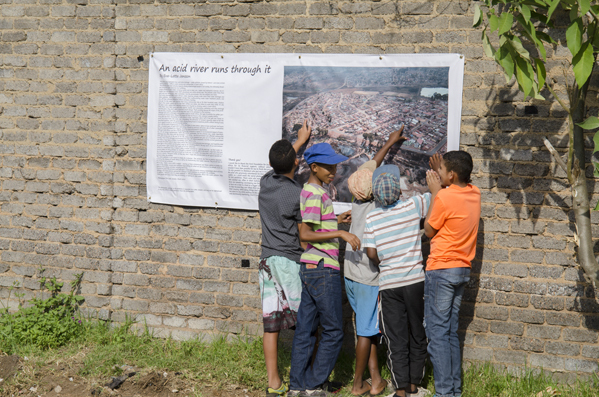 Staged a 67.5 meter-long exhibition in Davidsonsville, Johannesburg, one of the affected communities featured in the story, this weekend. Some pictures from the event this weekend. Check the fab spud ladies I met in Ethiopia. These women will probably bring a smile to your face. They do to mine. Or a mosquito one would like to swat away perhaps? – me that is, photographer and videographer for this interview with Malawian President Joyce Banda at the Presidential Palace in Lilongwe. It’s very interesting to sit face to face with those in the hot seat (re Cashgate and related) to get your own, direct impression. Armed rangers with sniffer dogs on patrol against ivory poachers in Kenya. Shot this video while in Kenya with The Sunday Telegraph on the story Futile slaughter of Kenyan elephants and how Britain is now fighting back.